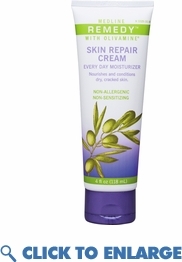 Remedy Skin Repair Cream helps restore the skin’s natural moisture balance. Indicated for all patients, including those who are at high risk for skin breakdown. Remedy Skin Repair Cream uses water molecules to not only moisturize the skin but also deliver the nutrients of Olivamine (amino acids, antioxidants, vitamins, MSM) to the cells. Once absorbed, the natural oils and essential fatty acids aid the skin repair process. While all Remedy products contain Olivamine, Skin Repair Cream contains twice the amount of any other product. This wound care product can be used with alternating pressure mattresses and hospital air beds. This wound care product offers protection for at-risk patients or for daily therapeutic use Remedy Skin Repair Cream is specially formulated for patients who are at-risk for skin breakdown. Helps block e-TEWL. It also provides relief to skin affected by dryness. Ideal as a facial moisturizer and even as a treatment for dry hands. CHG and latex-friendly Unlike other moisturizers, Remedy Skin Repair Cream will not interfere with the antimicrobial properties of CHG (Chlorhexidine Gluconate). It can be used before or after washing with CHG products. Additionally, it does not interfere with or degrade latex. Remedy Skin Repair Cream uses water molecules to not only moisturize the skin but also deliver the nutrients of Olivamine (amino acids, antioxidants, vitamins, MSM) to the cells. Once absorbed, the natural oils and essential fatty acids aid the skin repair process. While all Remedy products contain Olivamine, Skin Repair Cream contains twice the amount of any other product. This wound care product can be used with alternating pressure mattresses and hospital air beds. Remedy Skin Repair Cream is specially formulated for patients who are at-risk for skin breakdown. Helps block e-TEWL. It also provides relief to skin affected by dryness. Ideal as a facial moisturizer and even as a treatment for dry hands. Uses Temporarily protects and helps relieve chapped or cracked skin. Beneficial for face, hands, body and legs. Inactive Ingredients Aloe Barbadensis Leaf Juice, Ascorbic Acid, Ascorbyl Palmitate, Canola Oil, Cetyl Alcohol, Cholecalciferol, Citric Acid, Citrus Aurantium Dulcis Peel Oil, Citrus Grandis Peel Oil, Citrus Tangerina Peel Oil, Diazolidinyl Urea, Glycerin, Glyceryl Stearate SE, Glycine, Hydroxytyrosol, L-proline, L-taurine, Methylparaben, Methylsulfonylmethane, N-acetyl-L-cysteine, Niacinamide, Olea Europaea Fruit Oil, PEG-8, PEG-100 Stearate, Propylene Glycol, Propylparaben, Pyridoxine HCl, Retinyl Palmitate, Stearic Acid, Stearyl Alcohol, Tetrasodium EDTA, Tocopherol, Triethanolamine, Vanillin, Water, Zea Mays Oil. Begin the cleansing process with any Remedy cleansing product. Apply Skin Repair Cream. If the patient is incontinent, a Remedy skin protectant such as Remedy Dimethicone Skin Protectant, Nutrashield, Calazime® Protectant Paste or Clear-Aid Skin Protectant should be used. Skin Repair Cream helps protect and relieve damage related to frequent dryness, cracked, inflamed, reddened and itchy skin.